Cheap non-stop flights Manchester to New York for just £189! If you fancy spontaneous trip to New York check out this excellent offer based on British low-cost long haul airline Jet2.com. Just for one travel date you can book super cheap non-stop flights Manchester to New York for just £189 return! Base fare is including all taxes and fees but there is no checked luggage. (You can purchase extra). As mentioned there is only option available but hopefully someone can still make use of this offer..look for outbound on 5th of November and return on 9th of November…perfect opportunity for a short getaway to New York, one of the most demanding cities! 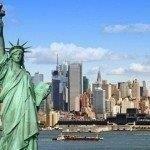 Need affordable accommodation in New York we suggest to book through Booking.com, or Hotels.com. Booking is the cheapest directly at website of the airlines where you can check further details of this last-minute promotion. Booking sample of cheap non-stop flights Manchester to New York for just £189! (Last minute & short trip). Your outbound flight from the United Kingdom to America would be on 5th of November. Inbound from New York Newark back to Manchester 9th of November 2018.